Neither Andrew nor I have ever been in Spain for Semana Santa. We have seen many photos of the rich Easter processions, and there is a bar in Granada that has a video of Semana Santa processions on a loop. The bar is a shrine to all things connected with Semana Santa: Cofrades (brotherhoods), La Virgen, icons of every shape and size, and walls covered in posters of Jesus and the Virgin Mary. Quite fascinating, but I digress. 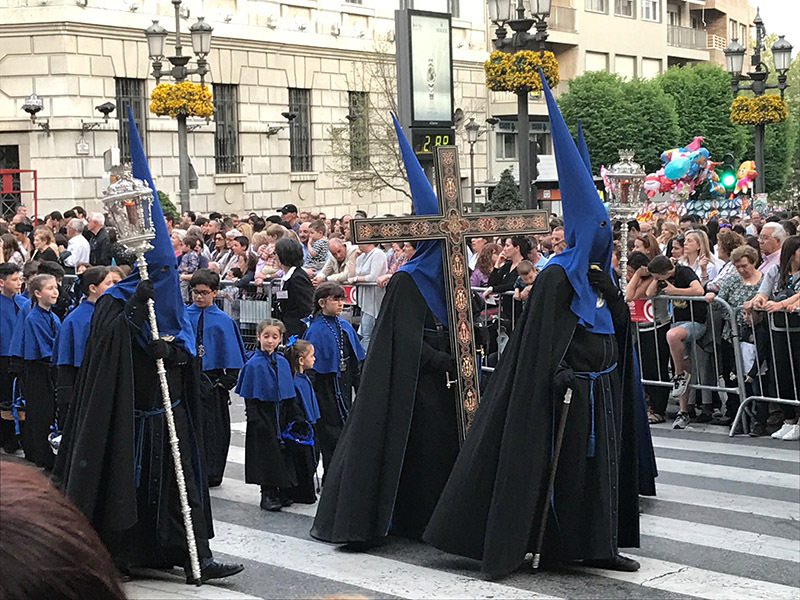 As we are here for Easter this year, it made perfect sense for us to go into Granada for at least one of the days during Holy Week to see some of the processions first hand. As it happened, a visit from Andrew’s Dad and a catch up of work meant that we were fairly restricted as to which day we should diarise, but we knew that we wanted to see El Silencio - a procession that starts at midnight bridging Jueves Santo and Viernes Santo (Maundy Thursday and Good Friday in UK parlance). Easter in Spain is a HUGE affair, and starts on the Sunday before Easter Day and runs right through that final week of Lent. Holy Week is marked by a series of processions that depict various moments in the Passion of Christ - the time leading to his crucifixion and resurrection. 32 cofrades (fraternities or brotherhoods) and 2,000 costaleros (more about these later) bring together 58 processions that weave their way through the streets of Granada, and these processions are made memorable by the sight of Los Penitentes or Los Nazarenes - members of the cofrades who wear the cloaks of their brotherhood, covering their faces and topped by the tall capirote - the pointed conical hat symbolising the penitent. Los Penitentes walk in front of and behind magnificent thrones bearing effigies of the Virgin Mary and Christ, all richly decorated with banners, flowers and candles. Jueves Santo and Viernes Santo are public holidays, so we were slightly concerned that there would be a lot of traffic leading into Granada and that the car parks would be full. However, surprisingly, the roads were quiet and the car park had plenty of space. It was only when we walked into the centre of the city that we realised the impact of Holy Week. Now, I am not religious by any stretch of the imagination, but I have to admit that I think the Spanish do religion really well. I am a newby in this country, but I find their attitude to religion to be balanced and liberal, despite this being a very staunchly Catholic country. I have written in previous posts that the people here have an almost tongue-in-cheek approach to religion. That is not to say that it is not taken seriously; it is, and this is evident everywhere you go. However, religion seems to be the foundation for life here - the cornerstone of family, society, community - rather than some rather pompous and anachronistic form of indoctrination and discipline. My overwhelming impression of Granada during Semana Santa is that it is a huge celebration for the family by the family, and this runs through the heart of Spanish life. The streets during the afternoon and evening of Jueves Santo were filled with families and friends and the atmosphere was celebratory, joyous, respectful and generous. It’s quite difficult to describe, but there was no sense of false piety, or some misjudged sense that, as this is a religious festival, one must behave accordingly, in some way. Respect seems to come naturally, and is a part of family life here. The city centre is all but closed off for the processions, and tiered seating is provided for the ‘great and the good’ at strategic points along the route. Bars and restaurants were all open, along with a handful of shops catering for visitors, primarily. The sun was shining and it was warm; the promise of a balmy evening. A sense of goodwill and friendliness prevailed. Street traders had stalls selling everything from toy drums and bugles, helium-filled balloons to jacket potatoes, the latter being something we, in the UK, associate with the depths of winter, and so they seemed somewhat misplaced on an afternoon where temperatures hit 28 degrees! But jacket potatoes are a typical Easter food here. 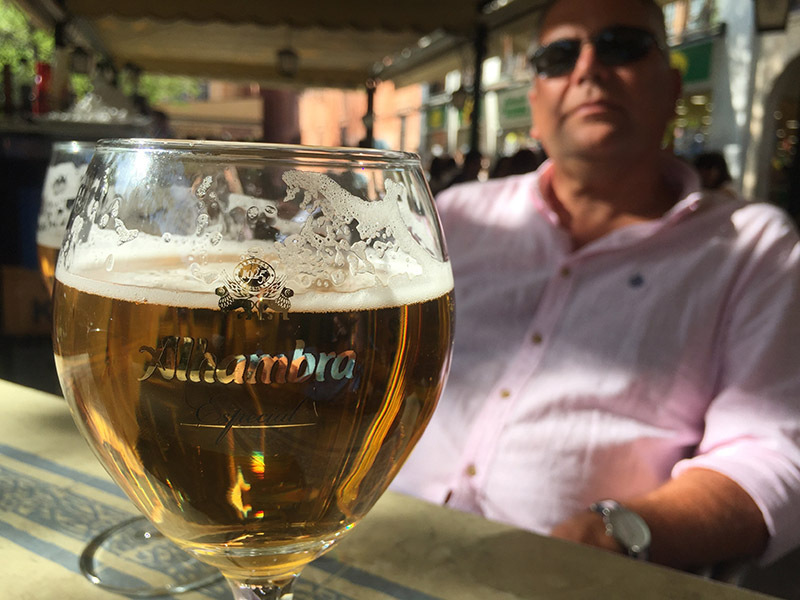 Andrew and I enjoyed a drink in Plazas del Carmen and Bib Rambla before heading around the Cathedral towards Plaza Nueva. We had seen the schedule of processions, but didn’t really have an idea of the form, and specific timings for each procession. Each day can have as many as 5 different processions leading through different areas at different times. I thought that if we headed for Plaza Nueva, one of the main vantage points, we wouldn’t go far wrong. Sure enough, as soon as we arrived, one of the processions passed through. Women, dressed in black and sporting peinetas and mantillas, high head combs and black lace shawls, lead the procession, and Los Penitentes followed, all in black, just ahead of a magnificent silver throne, candles burning and surrounded by wisps of incense smoke, and edged with floral displays. In the centre stood a glorious representation of La Virgen. Each of these thrones is borne by the unseen costaleros - a band of up to 35 people beneath the throne, concealed by drapes and who step slowly, in time, bearing the load and (apart from their feet) never being seen. 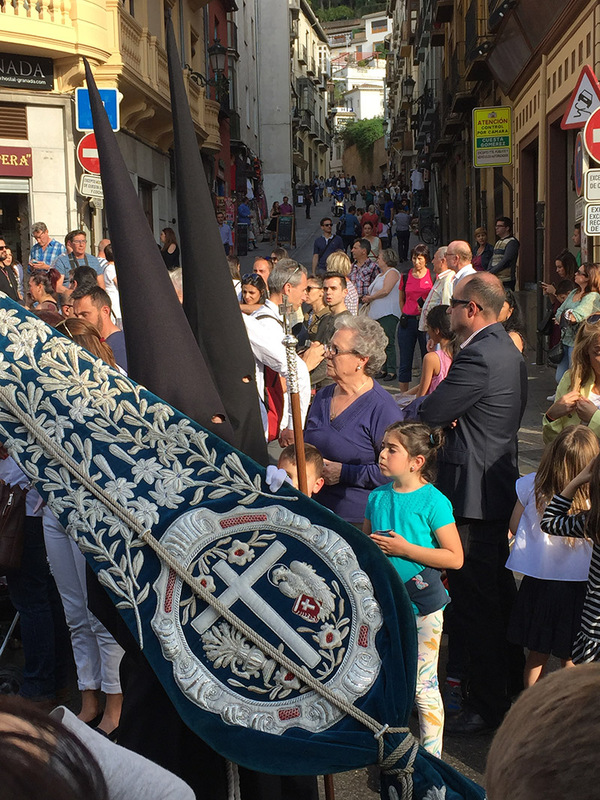 Every so often, the procession comes to a halt to provide a break for the costaleros, and for the rest of the procession to keep to their scheduled time in what must be a logistical headache of co-ordination. Bands from Granada and the surrounding towns follow the throne as it sways gently through throngs of people, the sound of brass and drum announcing the arrival of the procession. We were due to meet some Spanish friends in La Puerta Real, one of the other main vantage points in the city, so we threaded a path through central Granada to reach our rendezvous point at exactly the time when another string of processions left Calle Angel Ganivet (lined as it was with tiered seating for dignitaries) and passed right in front of us. This time, the thrones told the story of Christ carrying his cross, followed by the Virgin Mary and then a depiction of the crucifixion. I am by no means a spiritual person, and I really am not keen on the religious services offered by the Church of England. I find so many to be pompous and insincere. I find my own 'spiritual' connection through the magnificence of ecclesiastical architecture and choral music, and those elements transport me to somewhere as close to spirituality as I can imagine. These parades in Granada had a similar effect on both Andrew and I. Whether or not you believe in the Crucifixion and Resurrection, there is no denying that there is something extraordinary about this display, and the way it brings people together. We found it moving that people would reach out their hands to touch the throne as it moved slowly past, and applaud the costaleros as they shouldered their burden after a pause, or navigated a narrow turn on the journey. Life goes on around the Semana Santa processions, and the populace were out to have a good time, eating and drinking, chatting and generally soaking up the atmosphere. We went and had chilled wine served from an ice cold pottery pig’s head (another story! ), and enjoyed tapas in a full bar, with local people and visitors from other parts of Spain. The main event, for us, was the El Silencio procession which set out at midnight and came to an end at 4am on Viernes Santo (Good Friday). These processions are not designed for people who enjoy an early night, and the magic is merely intensified as natural daylight fades and the candles take over. Clearly, the entire city had come to see El Silencio, and the route was lined with crowds 20 people deep; more in parts. The sense of anticipation is as thick as the scent of incense and fresh orange blossom on the trees in so many of the squares. We managed to find a spot opposite Plaza Nueva, so could see towards Carrera del Darro, from where the procession would emerge. As the procession nears, the city’s lights are extinguished and the huge crowd quietens. In the distance, coming down Carrera del Darro, the glow of candles reflects off the golden walls of the buildings along the route, and gradually, this glow spreads magically as it moves ever closer. At this stage, we see nothing of the procession itself, but can just hear the sound of a single drum. Eventually, candle flame can be seen flickering as black-clad penitentes move round from beside La Iglesia de San Gil y Santa Ana and head into Plaza Nueva. An eeriness descends in the darkness, and there is something hugely evocative about seeing these cloaked figures, with their soaring conical hats dissolving into the shadows, occasionally illuminated only by their flick of candlelight, walking slowly through a silent throng. The drum grows louder; a monotonous and sombre beat, and in the faint glow the figure of the Christ on the Cross emerges from the dark, narrow street. 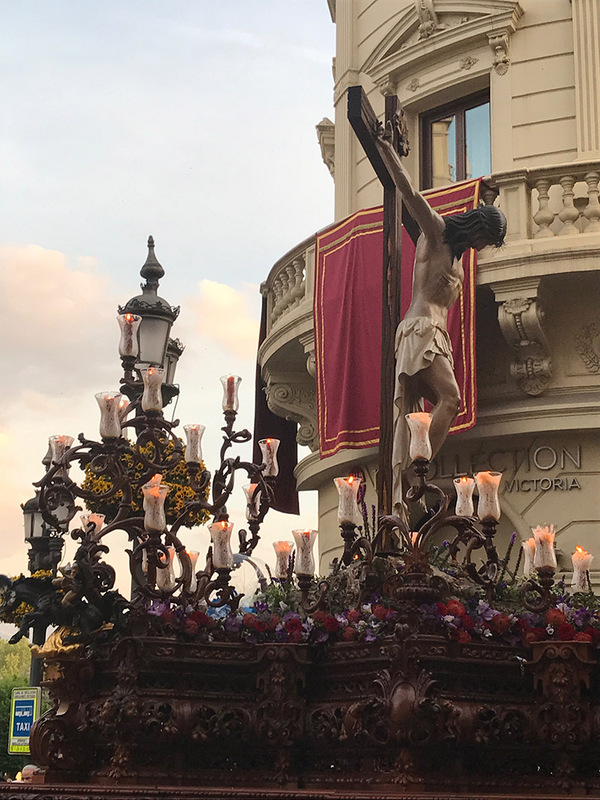 The Cristo de la Misericordia de José de Mora, the figure that dominates this procession, is considered to be one of the most anatomically perfect representations of Christ on the Cross and the sculpture dates from 1674. Magical, mystical, impressive, hugely memorable are words that come to mind when witnessing this centuries-old display of belief and faith. Having seen it, I can’t dismiss any of it as being turgid doctrine based on some outdated text, like so much of religion appears to be. To me, Semana Santa merely underlines this feeling that religion here underpins family and community. I taught a class of adults today, the day after witnessing only a part of Granada’s Semana Santa, and one of my students told me that she didn’t enjoy Semana Santa in her home town of Jaén. When I asked her why, she explained that she had seen it all before, and it had become boring. Andrew and I are seeing this incredible festival with fresh eyes, and we did marvel at the splendour and tradition, much in the same way as pageantry in the UK still impresses me hugely. It would be a shame if the younger generations did start to take these traditions for granted, and the magic gets lost over time.